Ft. 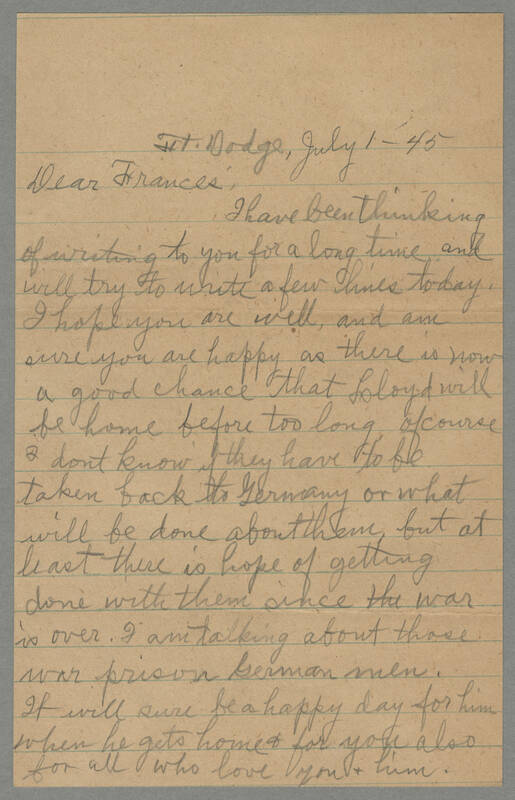 Dodge, July 1 - 45 Dear Frances, I have been thinking of writing to you for a long time and will try to write a few lines today. I hope you are well, and am sure you are happy as there is now a good chance that Lloyd will be home before too long, of course I dont know if they have to be taken back to Germany or what will be done about them, but at least there is hope of getting done with them since the war is over. I am talking about those war prison German men. It will sure be a happy day for him when he gets home & for you also for all who love you & him.